JOIN OUR E-CLUB TODAY FOR MEMBERS-ONLY BENEFITS! Lakefront resort large enough for bass tournaments, family reunions and large groups. The Shady Acre is a family owned and operated motel located next door to Silver Dollar City on Highway 76 and only minutes away from all the attractions that Branson has to offer. A PLACE WHERE YOUR EYES NEVER LEAVE THE WATER!! Full Service Moving Company, we offer a variety of services to give our customers the best moving experience! 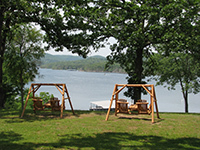 The Tribesman Resort is located, near Branson, on Table Rock Lake and on the beautiful peninsula of Indian Point. Located in the Aunts Creek Area, we promote a fun and friendly atmosphere where you can feel welcome and at home. We offer a variety of cabin styles that can accommodate anywhere between 2-12 people. The luxurious accommodations at D'Monaco are truly heaven on earth! Crest Lodge is a family friendly resort. We are nestled in a no wake cove on the quiet side of Table Rock Lake. We offer well updated individual private bedroom cottages. Come and take a look! Three generation veteran owned. Family and Pet friendly. Enjoy our 70 foot water slide and refreshing pool. Extensive hot breakfast menu included with room. A group of lakefront resorts and RV Park/Store in the desirable Aunts Creek area of Table Rock Lake. Lakefront resort with cabins for families and fishermen! Enjoy fishing, boating, and water sports on Table Rock Lake from our private boat dock, or take advantage of our bass boat and pontoon boat rentals for an afternoon of fishing or family fun. A newly renovated resort with great charm in a quiet cove on Table Rock Lake! One-, two-, three-, and four-bedroom resort suites that sleep two to ten guests in 353 to 2,540 square feet. Living/dining areas, full kitchen, washer/dryer, whirlpool tub and private balcony. Save 15% Off Resort Suites! Eleven Lake Front Resorts to choose from. Something for everyone without the Traffic and Crowds!! Fishing Special at Mill Creek Resort! Chateau On The Lake Resort, Spa & Conv. Ctr. Relax! Rediscover! Reconnect! At Branson's award-winning Myer Hotels! Memories are made at Cedar Wood Resort and Table Rock Lake! We are the perfect place for family vacations of all sizes, family reunions, fishing trips, company retreats, military reunions & much more. Table Rock Resorts at Kimberling (formally Kimberling Inn) has everything one might need for a spectacular vacation. Book 2 nights at Table Rock Resorts in the month of April and get a $500 Club 365 American Express Privileges Savings Dollar Card! Experience the rustic beauty of a timeless forest and relax in solitude surrounded by nature. 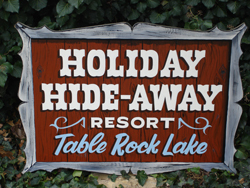 Relax in historic cabins, swim in our lagoon shaped pool and hot tub, fish, rent a boat, and find your peace and happiness right on the shores of Table Rock Lake. Just 20 minutes south of Branson, MO. Quiet, relaxing individual cabins, condos; boats on Table Rock Lake! GREAT resort for reunions too!